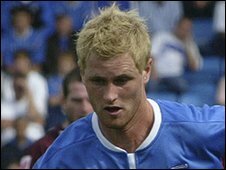 Former Gillingham striker Gary Mulligan has joined Northampton Town on an initial one-year contract. The 24-year-old former Wolves and Sheffield United player was released by the Gills at the end of the season. "He gives us something different to Adebayo Akinfenwa and Steve Guinan," Cobblers boss Stuart Gray told the club's website. "He is an unselfish player and of course he will hopefully chip in with some goals himself." He added: "I worked with him at Wolves at the start of his career so I know him well and I know what he can do. "He is a team player, he works his socks off for the benefit of the team and he can stretch defences with his work rate and his ability to create space and opportunities for others. "He has a good pedigree and he is still young enough and hungry enough to really kick on and I think he will do well for us".